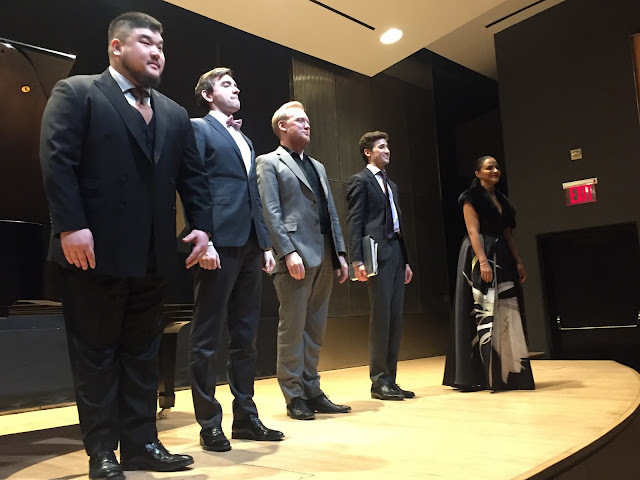 Once again, we are in the position of singing the praises of the Lindemann Young Artist Development Program. Regular readers are familiar with the high esteem in which we hold this program. Since singing praises is not what you are here for, let's talk about the actual singing. There were three splendid singers and two sensitive collaborative pianists on the program, all of whom we have reviewed before, all winners of various competitions, all with great futures ahead of them. That they all have terrific technique is a given, so let's take a look at their artistry, the interpretive technique that kicks their vocal skills up a notch. All three singers had performed their own translations which generally leads to a convincing delivery. Mezzo-soprano Rihab Chaieb had just the right manner of conveying the sense of the Apollinaire poetry that Francis Poulenc set so aptly. There are several moods expressed in Banalités and our preference was for the most banal of all. Ms. Chaieb knew exactly what she was singing about and the languorous line of "Hôtel" was just about perfect. The very brief "Voyage à Paris" was nothing short of sheer delight, filled with the charming notion of escapism. Her collaborative pianist Nate Raskin was with her cent pour cent, employing just the right light touch for these chansons. Later in the program, tenor Ian Koziara performed Tel jour, telle nuit, a collection of nine Poulenc songs, settings of text by Paul Éluard. Mr. Koziara introduced the songs by admitting that they sound like nonsense and, indeed, that is exactly how the surreal poetry struck us. If his French had not been so fine, we might have had an easier time of pretending that it was a language we didn't know but that is exactly what we had to attempt. We just paid attention to the fit between the sound of the voice, and the sound of Zalman Kelber's lovely piano. The two artists matched each other beautifully, especially in the energetic "À toutes brides" and in the gentle "Une herbe pauvre". Mr. Kelber's piano was most impressive in "Figure de force brûlante et farouche". The song that most approached comprehensibility was "Nous avons fait le nuit", a paean to a beloved. Here, the appealing nature of Mr. Kozaria's instrument stood out. Baritone Kidon Choi performed three songs from Mahler's Des Knaben Wunderhorn, putting us on more familiar territory. We are far more familiar with the "cute" songs from this collection, which often have an edge, but the songs chosen by Mr. Choi were filled with horror and heartbreak. It is one thing to speak out against war but hearing the three personal tragedies of which he sang grabbed us by the throat and never let go. These are difficult songs to get across but Mr. Choi succeeded admirably by dint of being very involved. Through his eyes, we could see "Der Tamboursg'sell" being led to the gallows. He used intense dynamic variations with a heartbreaking pianissimo on "Gute nacht"; Mr. Kelber's piano provided the grumbling drumrolls. We liked the way Mr. Choi softened the color of his hearty baritone when he portrayed the girl welcoming what we took to be the ghost of her soldier-lover at dawn in "Wo die schönen Trompeten blasen". And Mr. Kelber nailed the interesting figures in the piano. The powerful intensity continued throughout "Revelge" in which a fallen soldier has no one to carry him back to his quarters. His mates are marching as skeletons. It was completely chilling. Fortunately, we were not sent back out of the Bruno Walter Auditorium in that mood of despair. Ms. Chaieb closed the program with a set of songs by Sergei Rachmaninoff, each and every one a beauty. We always love songs about nature and about love! In "Lilacs", Ms. Chaieb was so present that we could inhale the fragrance of our favorite flower. We have walked along Lilac Walk in Central Park every May and June, just to have the experience that this artist created so successfully. The only song that wasn't joyful was "Do not sing, oh beautiful one"; but there is pleasure to be found in sadness also, especially when the melody is so haunting and sung with such longing. The recital ended with the very appropriate "Spring Waters", given an ecstatic delivery by Ms. Chaieb and Mr. Raskin. Gorgeous and timely!